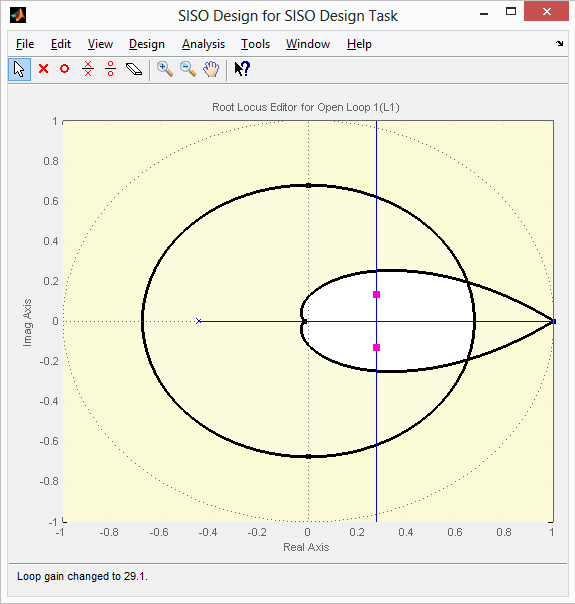 I'm using the control system toolbox provided by matlab to estimate the gains of my controller: using root locus design I get a graph like this one . I can add more detail to this answer later if you can provide your transfer function or block diagram you used to make that plot. Regarding your question, an X is a pole, so that is what the X on your X-axis is. Recall that, if you have a plant $G(s)$ ($ G(s)=1/s^2$ in your case), and you have a feedback loop, your transfer function becomes $G(s)/(1 +/- G(s))$, so you do in fact wind up with poles. If you believe you are viewing outdated information on your plot, then be sure to call 'clf;' between plot commands, with a 'figure(N)' command prior to focus plot N if you have multiple plots open. 'clf' clears a figure window. Finally, as a reminder, double check that what you are plotting is in fact the open loop system if that is that you would like to evaluate. If you are still having trouble, again, post the commands you are using to plot and I'll update this answer.